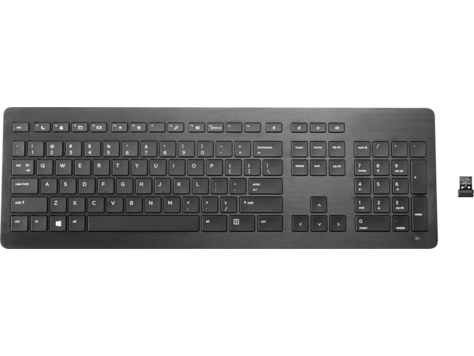 Boost your productivity and work comfortably at your desk or across the room with the elegant, redesigned, anodized aluminum-trimmed HP Wireless Premium Keyboard. Optimize productivity with a space-saving slim profile and ultra-quiet, low-profile scissor keys that foster focus, easy travel, and accurate typing. Get comfortable with adjustable slope, and breathe easy with a keyboard that resists minor spills. Work up to 30 ft (10 m) away from your PC with the Link-5 USB nano-receiver that also becomes a wireless hub for up to four additional Link-5 accessories so you can conserve USB ports on your PC. Conserve power with an On/Off switch and avoid surprises with a convenient LED that alerts you when the battery is low. Charge up while you work by plugging the keyboard’s micro-USB cable into any USB port on your PC.